I give everyone in my kitchen the same homework: Buy a real comal, give your chile powder away to Texans, get a selection of whole dried chiles (at least the top three if possible), teach yourself to toast light, medium and dark… and now you’re cooking MEXICAN! Not Southwestern or, God forbid, Tex Mex–MEXICAN! I say God Forbid Tex Mex because it is a renegade cuisine, light years removed from traditional Southern Mexican cooking. I say renegade because it breaks the law of traditional Mexican cooking, the same law that rules the great Oriental cuisines which are based on balance rather than any special secret blend of herbs and spices. If you get it in your mouth and it’s got balance, you instantly know you are eating the good stuff! Tex Mex goes off the charts on three elements particularly: TM cooks will add PALM LOADS of dried chile powder, oregano and dried cumin powder to a dish! 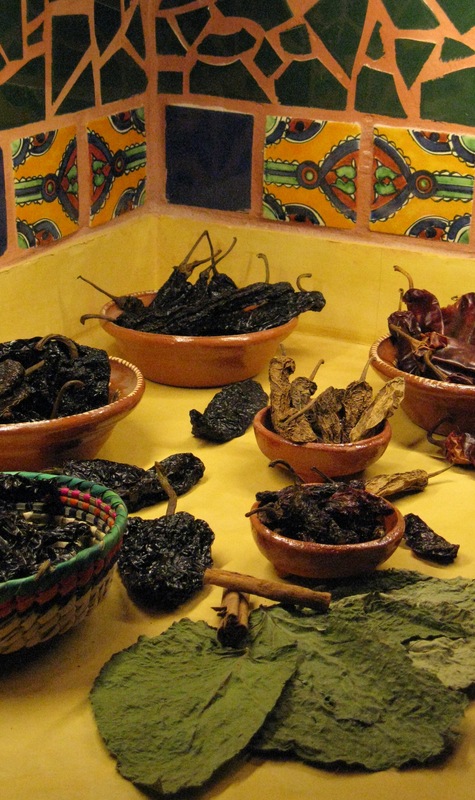 A traditional Mexican cook would never think of throwing a palm load of anything in a dish–spices are judiciously measured by what you can pick up with two fingers, three fingers or four fingers for a big batch of whatever is cooking, complex moles included. 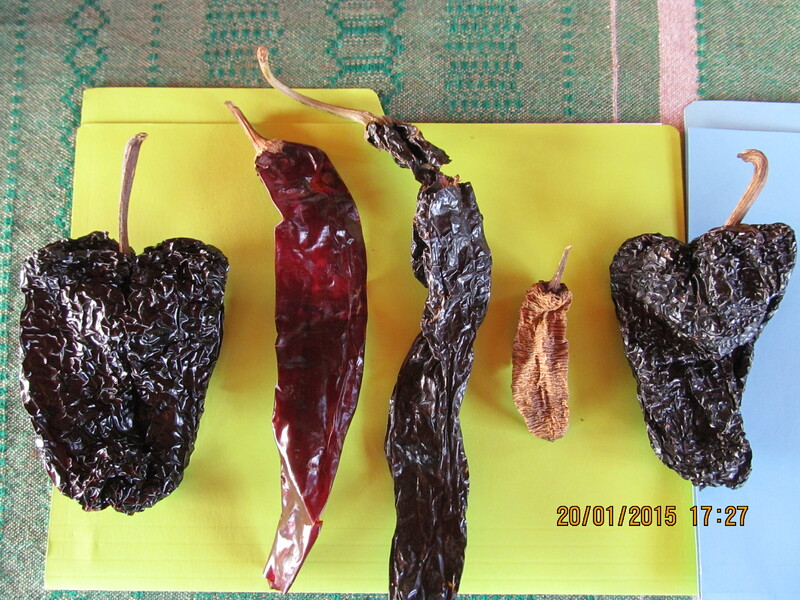 So which chiles do you need to get started cooking real Mexican dishes, and how do they work? The most used dried chile in Mexican cooking is the same as the most used fresh chile–it’s the poblano, but ripened to a deep red and sun dried. Now it’s called the ancho, and it’s as different from the poblano as raisins are from grapes. 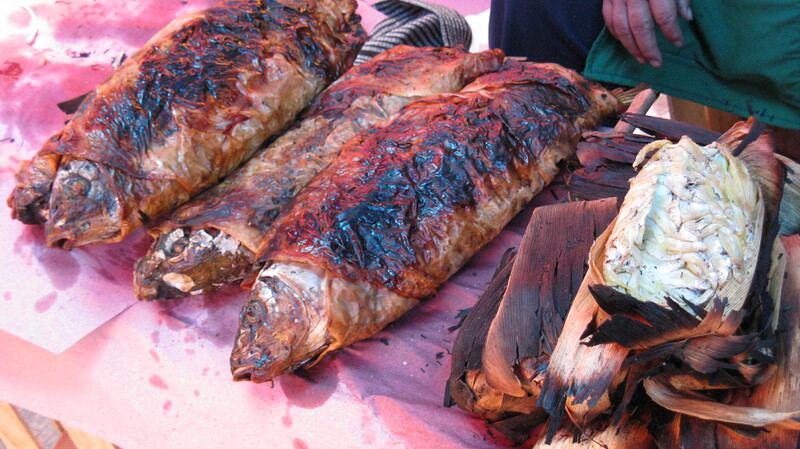 Ancho is pictured on the left. Ancho in spanish means “wide” or “broad”, and it should be wide at the shoulders and narrow at the tip–a heart shaped chile just like its fresh counterpart, the poblano. Most people, when asked to sniff a bag of anchos and identify their perfume, will sing out “raisins”! Fruity and bittersweet, anchos come in all shapes and sizes, but a classic will be heart shaped and about 3×4*, If you are lucky enough to be able to cherry pick them from a bin, the fresh one will be shiny and flexible, though you can still work with them even if they’ve gone pretty potato chippy. If they’re small, but still nice and fresh, I like to stand and pick out a bunch of them to stuff with Chihuahua cheddar and simmer in a pink cilantro cream sauce as a highly memorable starter… Remember you can stuff any chile, fresh or dried, with any number of good things! Chile powder will never do that for you. 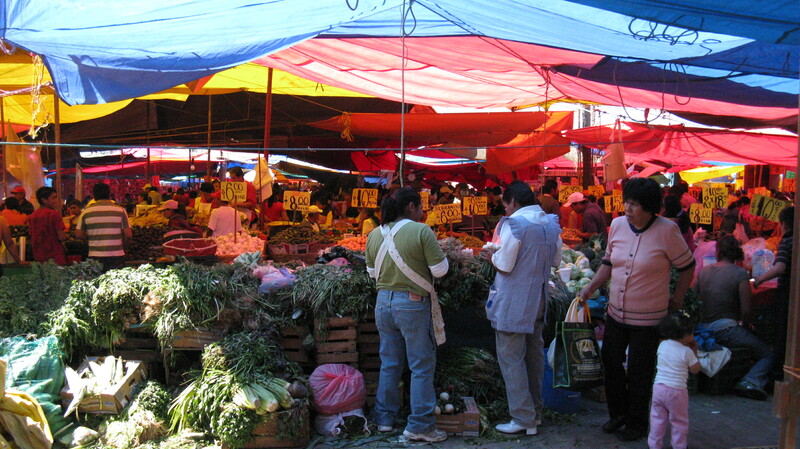 Note there is a confusing tendency in the North to call both poblano and ancho by the misnomer, “pasilla”. Study up and you’ll know what you’re buying. If you’re buying chiles in a bag, give them the Charmin test–if they’re squeezably soft they’re fresh, though you can work with them even if they’re past their prime. Get them home, go through them to make sure none are buggy or mildewed. They’re not sprayed in the fields as they know we’re going to be eating them, so you can thwart their tendency to go buggy by storing with a handful of dried bay leaves, and/or freezing them. Next in line number three in South Central Mexico, will always be the Mexican pasilla for its deep complex flavors so critical to a good dark mole. It is midnight black, deeply wrinkled and can go to crazy lengths of 10″ or more! If it’s shiny and flexible it is an amazing chile to stuff with cheese or picadillo, and toasted, soaked and pureed on its own it makes a satisfying salsa with the addition of just a little garlic, onion and salt. The little chile next to the impressive Mexican pasilla (not to be mistaken for the Oaxacan pasilla, which is another story altogether) doesn’t look like much, but it’s a powerhouse of flavor that has taken over the number three spot in the North. It’s the chipotle, and it’s a hot one, being a ripened, smoked jalapeno… and if you love smoke and heat, it’s an irresistable obsession. Use the dried version like a bay leaf, floating it in a pot of soup, stew or chile,anywhere you want smoke and heat, and remove it when you reach the levels you love. Buy cans of chipotle in adobo, puree them and keep in a squeezie bottle next to your ketchup. It will keep as long as ketchup and you can squeeeeeeze it anywhere you want that fabulous chipotle punch! The mulato is pictured on the far right. It is a softer, sweeter, almost chocolaty version of the ancho, so if you can get your hands on it don’t hesitate to give it a try. This should get you started. Now, how can you incorporate these gems in your cooking instead of the chile powder you just gave away to your Texan friends? Soak them in boiling water until they soften andthen puree, or better still, toast them on that comal you bought as part of your earlier homework and <em>then</em> soak them–this will bring out flavors you never imagined. Simply puree and add to any dish. The guajillo is the only one of the top three that should be sieved into your dish to remove the leathery skins that will not break down in cooking. Any of the others, including chipotle, can be toasted and cut or crumbled into your soup, stew or chile and they’ll cook right in. Here’s a parting shot of a classic comal made of cold rolled steel. Don’t buy a pretty, light weight, modern, non stick comal–you’ll wreck it the first time you use it because the technique is dry heat. 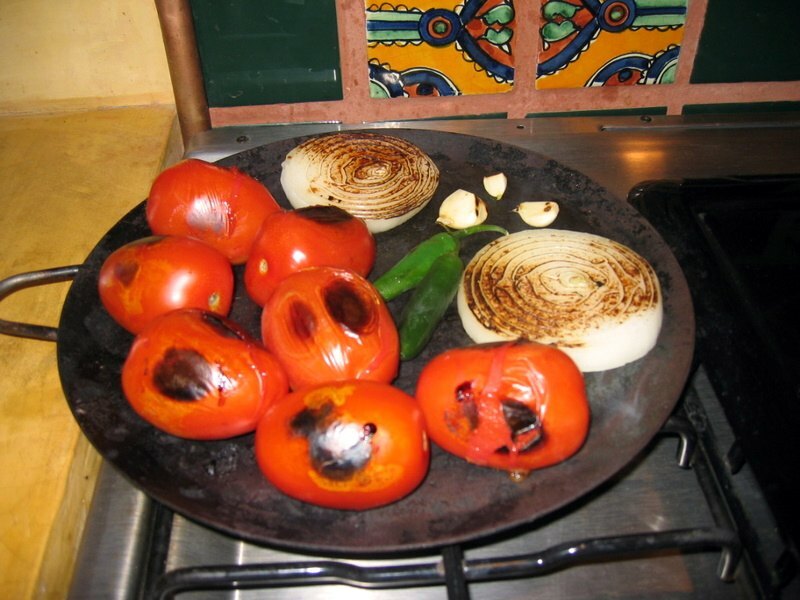 Never a drop of oil hits this Aztec griddle, which is why traditional Mexican cooking is so light, fresh and flavorful. Give it a good scrubbing with wet-n-dry sandpaper from Home Depot, dry it on a burner and you’re ready to toast up another batch of whole, dried chiles, whole spices, nuts, seeds… or whatever is cooking in your Mexican kitchen!